Clint Eastwood stars in the iconic Spaghetti Western from director Sergio Leone. Paramount R2 German disc. The Western has been a staple of American cinema since moving pictures were first developed and down the years a few enterprising European producers tried to cash in by filming their own Westerns, although these were largely forgotten. In the 1960s, the production of American Westerns began to decline as the genre began to stagnate, but eager European audiences were still wanting to see more tales of the West, so a few small production companies looked to fill the gaps in the market with their own films, disguised as American productions. In 1964, the somewhat unreliable director Sergio Leone, recently fired from second-unit direction on the American epic Sodom and Gomorrah (1962), was given a chance to make a Western. A life long fan of the genre, he had written his own script, looking to inject some new life into a genre he could see was becoming tired and saturated. A lone man (Clint Eastwood) walks into the town of San Miguel. A few miles south of the Mexican border, it is dominated by two families - one smuggling guns, the other smuggling liquor across the border to willing buyers. Seeing an opportunity to make money, he plays the families off against each other, getting paid by both sides and watching as they kill each other off, his motive, nothing more than to make profit. Initially penned by Leone during a quiet period in his career, and inspired by the popular Akira Kurosawa Samurai film Yojimbo (1961), the storyline for Fistful of Dollars takes a very simple notion, the idea of a drifter coming into town and playing on the underlying friction between rival groups, and gives it some real depth by making this the entire focus of the film, with no extrenuous scenes, characters or subplots. As a result the film is on a very small scale, particularly compared to the epic expanses of the sequels and to allow the development it is quite slow running, but it has a neatness that has been rarely matched and certainly never drags as it builds to a superb climax and effective ending. European film-makers are renowned for producing some of the darkest and most nihilistic Westerns ever seen (films like The Great Silence (1969) and Cut Throats 9 (1972)) and although not quite to this level, it is clear how Leone's script would start the ball rolling - the central character Joe is a pure anti-hero, not the grudging hero of many of the American films, but a real cold hearted figure who watches impassively as the groups he has set against each other, fight it out. This concept was so strong that for American television audiences a prologue was filmed to provide some moral motivation for Joe. Leone does allow Joe one scene of unmotivated kindness, but with the hints that the women he helps reminds him of someone he once knew, it just serves to add further depth and mystery to the character. If the script was reactionary, Leone's work behind the camera is a revolution - every shot in the film seems to be a work of art with Leone proving that he had complete command of the widescreen frame, making extensive use of the recently developed Techniscope film format which allowed for close-up and deep staging, which he uses extensively. With the film remaining in the one town throughout, the sets get a lot of attention and they look very convincing. Although not particularly gory, there is a lot of blood and some very convincing looking injuries as Joe gets viciously beaten. Probably equally as important to the production as Leone's direction is the soundtrack from Ennio Morricone, he had already worked on several Western titles under his Americanised moniker of Dan Savio but while his contribution to those films had been a catchy opening song and some incidental music, the score here plays a key role in the reactionary atmosphere that the film creates and it is perfectly suited. It was accepted at the time that an American actor would play the lead role in European films to help them sell internationally, the Peplum genre had almost exclusively used American leading men. The Italian Westerns followed suit, particularly when they wanted to sell the films as American productions. Leone had originally enquired about getting Henry Fonda (Warlock (1959)) or Charles Bronson (The Magnificent Seven (1960)) to play the lead role, but neither were interested in working for the tiny budget on offer. Clint Eastwood was a B-movie actor who had made some fame on the Western TV series Rawhide in the early 1960s, he took the role as a break from the television series and never expected to hear about the film again. Like most enigmatic lead characters, Eastwood isn't overly taxed by the role with his emotions for the most-part ranging from scowling to shooting, although when he gets attacked later on in the film, his physical acting is strong, conveying a man really physically injured, not just hurt. Gian Maria Volontè as Ramón plays the villain role with strength and there is a solid group of supporting actors, most of whom would return in the follow-up. 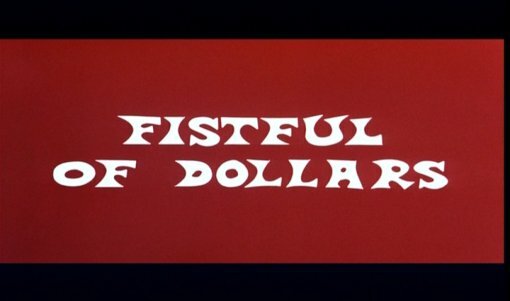 Fistful of Dollars was a very influencial film and performed well enough to create a trilogy, creating household names out of Clint Eastwood, Gian Maria Volontè, Ennio Morricone and Sergio Leone himself. The sucess of this film turned all Italian producer's eyes towards the Spanish deserts and within a year, the Spaghetti Western boom had begun. Boasting a strong storyline and some amazing direction this film is highly recommended to all and makes a good starting place for American Western fans to enter the world of the Italian West. Directed by anyone	interesting? Sergio Leone - One of the most famous Italian directors who made his debut on the Peplum Il Colosso di Rodi (1961) and later went on to direct the epic Once Upon a Time in America (1984). Good soundtrack? A groundbreaking score by Ennio Morricone that fits the film well. Who is it for? A very impressive film recommended to all. A great starting place for future Spaghetti Western fans. Radio Spots - 10 audio tracks, individually selectable. Availability German release. DVD Title: Für eine Handvoll Dollar This set is available individually, in a digipack with 'For a Few Dollars More' or in a special edition wooden box with the second film, also containing a Clint Eastwood branded pocketwatch (that sadly doesn't play the tune) and a film strip. Boasting a strong storyline and some amazing direction, this film is highly recommended to all. A fantastic looking uncut print, with original English mono soundtrack. A good mix of extras, although sadly no new special features are included (eg. German trailers or title sequences), nor Italian soundtrack. Viewers can choose between this and the MGM R1 discs. Find reviews of our other films scored by Ennio Morricone. All text in this review written by Timothy Young - 28th July 2006 & 25th August 2009.